According to the BBC (here), a 198 pound wild boar somehow got into a clothing shop in the French city of Poitiers, charging at customers and police before being taken out. Fifteen people were evacuated from the store, which was closed for two hours. 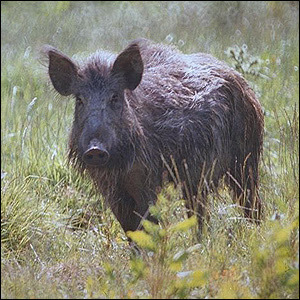 While I'm sure there are better accounts in French, which I don't read, the BBC piece notes that for some reason wild boars were being relocated in the area by forestry workers. I, of course, thought of wild hogs yesterday on the drive to Hilton Head for the holidays, as we crossed the Ocmulgee River and traversed good wild hog territory. The Giant Peccary, Found at Last!